Mountain goats, youre on notice! A brave little bear cub followed its mother up a nearly vertical rock face. 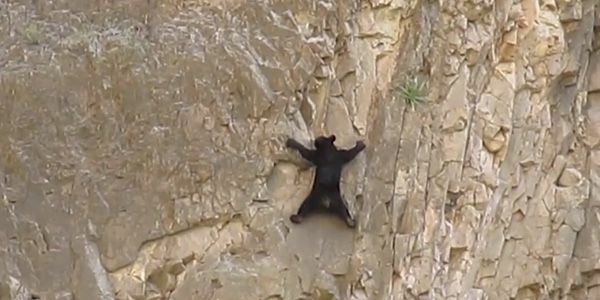 This video shows that bears can rock climb with the best of them. The ability of bears to climb trees and ladders has been documented widely. But this is one of the first times bears climbing rocks have been recorded. It was caught by Stephanie Latimer, a self-described nature enthusiast. She captured the moment while kayaking through Santa Elena Canyon in Big Bend National Park in Texas. These are Mexican Black Bears, a subspecies of black bear listed as endangered in Texas. They grow to weigh 200-400 pounds. Critical thinking challenge: How can bears climb rock faces without the special equipment that humans require? Do you toss your cafeterias food in the trash? Bears can climb almost anything, they have webbed feet and it kinda helps them by grabbing on to things easier like trees,rocks and anything else. They also have long claws that stick into things because there nails are so long and sharp and thick . They do have thicker feet than us so nothing really hurts them. The bears are born with sharp claws and they use them to dig into the mountain side and pull up. And how can they say that all bears can climb things when they've only recorded one bear actually climbing. Because,They have claws to keep them selves up on the sides of mountains,trees,ladders,etc. That is so cool that bears can climb rock! 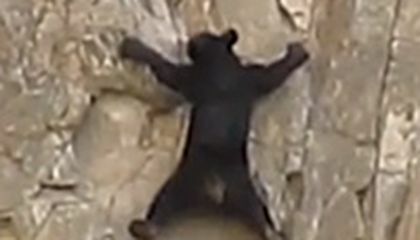 If i was a bear I would be really scared to climb a vertical rock with no harness. That would be really exciting to see. the bears can climb the moountain side of rocks without regular equipment because they have claws that can dig into the side of the rock to help them. Because they have claws that can dig into the face of the mountain . Humans don't have sharp claws and they can't climp with no equipment . I've never seen bears climb, the only time I see one is at the zoo and they don't really do anything. But I found this strange beacuse I never knew they could do such things.